We often get bogged down in working in our businesses, rather than working on our businesses. How does proper back office management impact the bottom line? How can making a plan to manage, motivate, and compensate the team actually increase revenue and profits? This session will help us find out. The biggest mistake many agencies make is failing to have a staffing plan for the future. Selling insurance is one thing, but “managing” your agency’s team, is another topic altogether. This class will discuss the need for human resource management, and the areas that you need to focus your efforts to build a good agency team. Once you understand your HR needs, the staffing and motivating of your agency personnel is critical. How many employees you need and what core competencies they and your managers need will be addressed as well as how to properly compensate them. 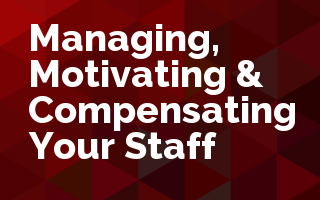 Determine what motivates your staff in order to establish goals & compensation strategies. Different types of compensation & bonus plan options. How to show your team how valuable they are through an individual Hidden Paycheck tool.